Send your children on an expedition to Brazil, Italy, Saudi Arabia and beyond. Watch them absorb facts about world cultures while they search for Carmen and her wily gang, who are stealing world treasures such as the Great Barrier Reef from Australia. Specially designed for younger children ages 5 to 8, this game features new activities kids will love. Children develop memory and matching skills, gain familiarity with maps and symbols, and learn to piece together clues to solve a mystery. So come on–we need your child's help to catch Carmen! Play along with Zack, Ivy and The Chief from the Emmy Award Winning TV series. Learn about different countries as you explore the world. 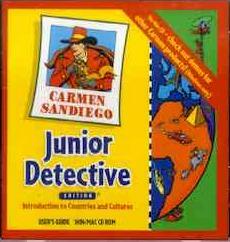 Broderbund's Carmen Sandiego Junior Detective Edition software is an exciting, fun-filled animated journey around the world aimed at 5 to 8 year olds. Clever animation combined with vivid photography makes Carmen Sandiego Junior Detective Edition great entertainment for kids as young as 4 years old. Meet Zack, Ivy and the Chief as kids play along for hours. Easy to navigate, clues are given in pictures and spoken dialogue with lots of help from the ACME Detective Agency. Ever want to send your kids to Saudi Arabia? It's only a mouse click away when they play Carmen Sandiego Junior Detective Edition. Kids stumble on some pretty amazing facts about different countries as they search for Carmen and her wacky gang. Kids start their worldwide chase by signing in on the GizmoTapper, a sophisticated yet wacky crimestopping gadget. Of course, the ACME Detective Agency provides our young detectives with built-in help with Dee Jaye, the voice of the GizmoTapper. There's an option to turn off the automatic help, although children can get help at any time during a case by clicking on Dee Jaye's Call Button. Each case concentrates on one region of the world so kids can discover different countries and world cultures. After the Chief greets his new agents, kids click on a flashing Map Button to continue. A Map Screen rolls down to show them a world map, while it automatically zooms in to the country where the crime took place. Kids piece together a Wanted Poster puzzle to identify which crook they are chasing. It's important to search every inch of the screen when kids move a virtual magnifying glass across the screen looking for clues. The magnifying glass lights up and hums when kids zero in on a clue. Then, it's off to the Travel Map where kids match the clues found at the last location with the pictures they see next to the countries on the map. Pre-readers and readers will practice their memory skills by collecting clues and paying attention to country flags, animals and local products. The object of the game is to catch the villains before the GizmoTapper runs out of juice. Good versus bad is the prevailing theme in this software. Although silly sayings such as "Let's bust some bad guys" are common, kids are too busy collecting clues to pay much attention (and repeat) to them. As kids capture members of Carmen's gang, they'll be promoted through a series of eight ranks from Rookie to Super Sleuth. Promotions are great fun for the kids as they are commended for a job well done. Catching Carmen is the ultimate honor for any agent, of course. Playing Carmen Sandiego Junior Detective Edition is one way to prepare for Broderbund's Where in the World is Carmen Sandiego? CD-ROM, which is aimed at kids 9 and older. It's also an awesome way for kids to see the world without a passport as they develop memory and matching skills, gain familiarity with maps and symbols and learn to piece together clues to solve a mystery.